Ranked #1 out of 88 tours in Ketchikan on TripAdvisor, the Bering Sea crab tour receives a host of glowing reviews from visitors who have boarded the famous fishing vessel Aleutian Ballad for this exciting Deadliest Catch tour. Yes, the Aleutian Ballad and its hardy crew have been featured on Discovery Channel’s Deadliest Catch documentary show! Unlike the crew, however, you won’t be experiencing the wild weather and rough seas of the open ocean that make for jaw-dropping television viewing: During your tour, the boat stays within the calm and protected waters of the Inside Passage and cruises the bays and islands around Ketchikan. What you’ll experience is nail-biting excitement as the fishermen haul in their catch, the chance to spot amazing wildlife like eagles and whales, and the opportunity to hold a huge, live Alaskan king crab for a once-in-a-lifetime photo moment! During the 3 ½ hour Deadliest Catch tour, you’ll also be regaled with colorful tales of the crew members’ daring and dangerous adventures on the high seas. The Aleutian Ballad is docked within easy walking distance of the cruise docks and downtown Ketchikan hotels, and seating onboard the Bering Sea crab tour is in either a heated and sheltered amphitheater or a panoramic upper deck, with excellent views from either option. As you’re introduced to the Deadliest Catch tour crew, you may recognize some from their battles with the elements on television. The crew will keep their binoculars at the ready and alert you if they spot any wildlife each time the boat draws close to shore. Then, when the time comes to haul in a catch, it could include rockfish, stars, octopi, prawns, halibut, and, of course, giant crabs! The catch is placed in holding tanks onboard for you to view, feel, and touch before it’s released back into the water. This Bering Sea crab tour will be a highlight of your Alaskan adventure, so be sure to be early to book your place on this popular and exciting excursion. 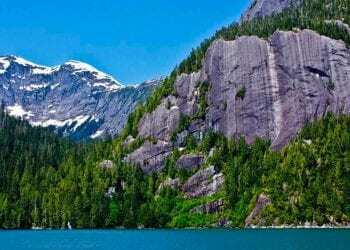 If you’re also heading to Skagway and are looking for another exciting coastal wildlife adventure, you might consider the Glacier Point Wilderness Safari. The minimum age for participants on this tour is 5 years old, no exceptions. This tour is appropriate for guests with limited mobility and is wheelchair accessible., Scooters are also allowed onboard the vessel as the main deck area is all one level. If you need assistance getting to the boat, please contact us in advance. Answer: Ketchikan is located within Alaska's Inside Passage. The water here is normally very calm. Even when the winds pick up during the winter months and the weather gets bad, the islands create a break for us and we hardly see a wave.The F/V Aleutian Ballad is over 100 feet long and made of solid steel. The boat was specifically created to handle the roughest seas in the world. Also, as the seating area is outside (covered and heated, of course), there is always a lovely cool breeze that refreshes the senses. If you are extremely sensitive to motion, you may want to take typical motion sickness medicine before coming. However it’s highly unlikely that you will need it. What will we see and do on the tour? Answer: The Aleutian Ballad is actually docked at Berth 3 in Ketchikan and within walking distance of downtown and the cruise ships. A representative from The Bering Sea Crab Fishermen’s Tour will be waiting for you at the bottom of your gangway (steps off of the boat) 30 minutes prior to the tour departure time. Look for the bright yellow jacket and the sign that reads, “Bering Sea Crab Fishermen’s Tour.” You'll receive an email confirmation with full meeting instructions upon booking.